2017 is the Year for Sustainable Tourism. 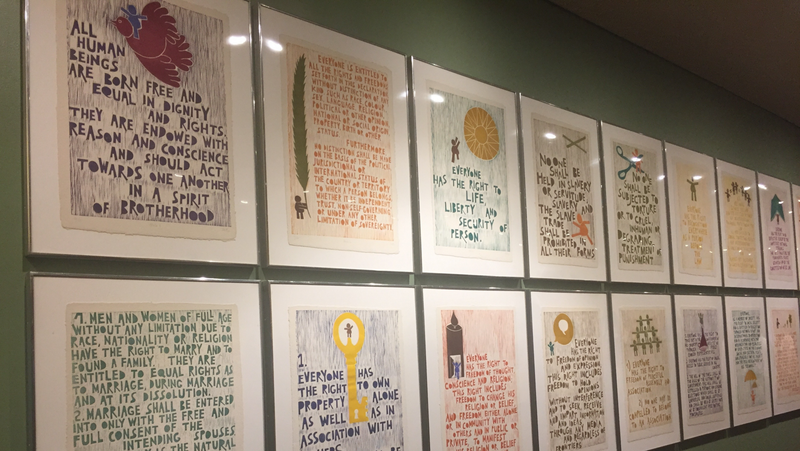 But at Operation Groundswell, we want to go beyond the buzzwords, flashy promotions, and string of feel-good global events. 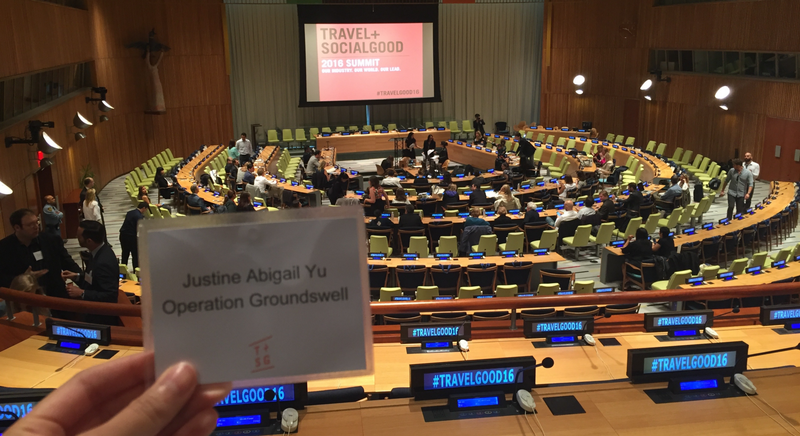 A couple of weeks ago, I had the unique experience of representing Operation Groundswell at the Travel+Social Good Global Summit. Taking place at the United Nations Headquarters, OG joined a number of other leaders within the travel and tourism space to develop a realistic road map that would push our industry towards creating deeper positive impact and social change. How do we mainstream sustainable tourism? At nearly 10% of the global GDP and growing at a faster rate than even the wider economy, tourism is a force to be reckoned with. It has a massive role to play in shaping the economic, environmental, and social future of our world. It has the powerful potential to facilitate cross-cultural exchange and therefore catalyze empathy and solidarity while also fiscally supporting and building emerging communities. It’s no wonder then that the United Nations has declared 2017 as the International Year for Sustainable Tourism. But the key word here is potential. At OG, we spend a huge chunk of our time thinking critically and speaking out about the the irresponsible and unethical practices within voluntourism. Zoom out onto the wider travel and tourism industry and you’ve got even more problems. At its current state, the industry is fraught with issues — from environmental degradation to cultural disrespect and exploitation, from waste management failures to the ‘leakage effect’. That’s why we were so excited to be invited to the Travel+Social Good Summit where we could tackle these issues head-on and begin to find solutions to this core challenge: how do we mainstream sustainable tourism? People want to make a positive impact on our world. What else can explain the massive growth in international volunteering and the shift in conversation towards sustainability? But that benevolence is not enough. It must be coupled with nuanced research, critical thinking, and collaboration. If we want to mainstream sustainable tourism, the first and most necessary step is to create awareness about the problems with its current state. Media plays a huge role in this by exposing how tourism is truly affecting destinations around the world, positive or negative. Slowly, we are beginning to see this. The T+SG Media Network, for instance, is an alliance of journalists, content creators, and social media influencers dedicated to highlighting both the positive and negative effects of tourism. The New York Times recently ran a piece on the dark side of the international climbing and guiding industry and its effects on Sherpas and remote communities. A blogging campaign, #StopOrphanTrips, coordinated by Better Volunteering, Better Care, exposes the exploitative practices of orphanage tourism. And the cruelty of many wildlife tourist excursions has garnered quite a bit of media attention in recent months. These campaigns and initiatives are critical to pushing sustainable tourism to the forefront of travelers’ minds. And just as the media has a responsibility, so too do travelers. As these conversations begin to permeate the mainstream consciousness, travelers have a responsibility to do their due diligence and research the sort of travel experiences they are investing in. Not knowing is no longer an excuse. How many times have we seen initiatives that never actually invite to the table the very communities they seek to “help” or “empower”? A million times too many. It’s something we’ve seen all too often in the voluntourism industry (and in development, in general) and it’s precisely why OG was founded ten years ago. We were tired of seeing voluntourism businesses and, yes, even governments, charities, and international institutions pushing their agenda without ever consulting the communities they were supposedly “developing”. We wanted to forge the way towards a new model where we would work in partnership with local non-profits and grassroots organizations on community-requested projects. Not as a handout, not as charity — but in solidarity. And when I say prioritizing community needs, I’m not just referring to marginalized communities. Mass tourism has had detrimental effects on all communities — rich or poor, east or west. Just take a look at what it’s done to Barcelona or Venice. This requires a monumental shift in thinking. Businesses and organizations operating all across the supply chain — hotels, attractions, transportation, tours, restaurants, etc. — will need to make this a priority if we are to mainstream sustainable tourism. Travelers can only do so much in their research. Ethical and responsible alternatives actually need to exist as a choice. …which is not to say that responsible alternatives don’t already exist. A handful already do. We saw examples of such at the T+SG Summit with industry leaders such as 1Hotels, a boutique and eco-friendly hotel brand. But let’s be real, this is luxury. And many other eco-friendly and ethical alternatives out there are also luxury, or at least exist somewhere on the higher end. A lot of the conversation about mainstreaming sustainable travel disregards the privilege around it. But if we want even the most casual traveler to be responsible in their choices to go abroad, we have to also provide options that make sense financially. This will be a huge challenge. I don’t have the answers for this one but I know that it’s a big piece that will be integral to the goal of mainstreaming sustainable travel. People want to give back. People want to choose sustainable and responsible alternatives. But more often than not, it’s just not financially feasible. At OG, we’re trying to do our own part to tackle this particular challenge. We want anyone and everyone, regardless of socio-economic background, to have the opportunity to experience our international service learning programs. That’s why we have always offered and will continue to offer financial assistance to anyone experiencing financial strain, including individuals from low-income households, students, and recent graduates. Financial accessibility is a value that permeates throughout our entire backpacktivist community. So much so that our network of alumni and other friendly backpackers, started the Groundswell Education Fund, a registered charity that provides scholarships for our international programs to exceptional young leaders who might not otherwise have the chance to go abroad and engage in cross-cultural collaborations. This might be just one small step in the wider scheme of things, but it’s one we’re truly proud of and hope to continue forging through. The goals for the Year of Sustainable Tourism are ambitious and the stakes are high. But we’re thrilled to see conversations and collaborative action around responsible and ethical travel finally taking the global stage. OG has always believed in the power of travel to open up an individual’s perspective, deepen cross-cultural connections and understanding, and ultimately change the world. It’s why we do what we do and why we’ll continue pushing the boundaries of our impact both in the voluntourism industry and the wider travel and tourism space. We can’t wait to share the exciting new partnerships and initiatives we have planned to continue making this happen. Stay tuned! A community of backpacktivists that are socially, environmentally & politically aware of their impact in communities they travel to and live in.